Goliath contains 36 all time favorites combined with fabulous technology never before seen at home. There are artillery shells with tails, others with crackle, and some with changing colors. Watch out for the palm trees, chrysanthemums and whirlwinds. This one is loaded with shells that give you two distinct breaks in the air at the same time. You will want to salute the spectacular new triple break, an industry breakthrough that paints the sky with three patterns at one time. A Great Grand Finale!! 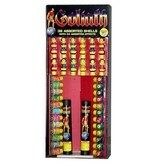 The shells, the assortment comes with 36 reloadable shells including: 12 singles, 6 doubles, 6 triples, and 12 canisters. 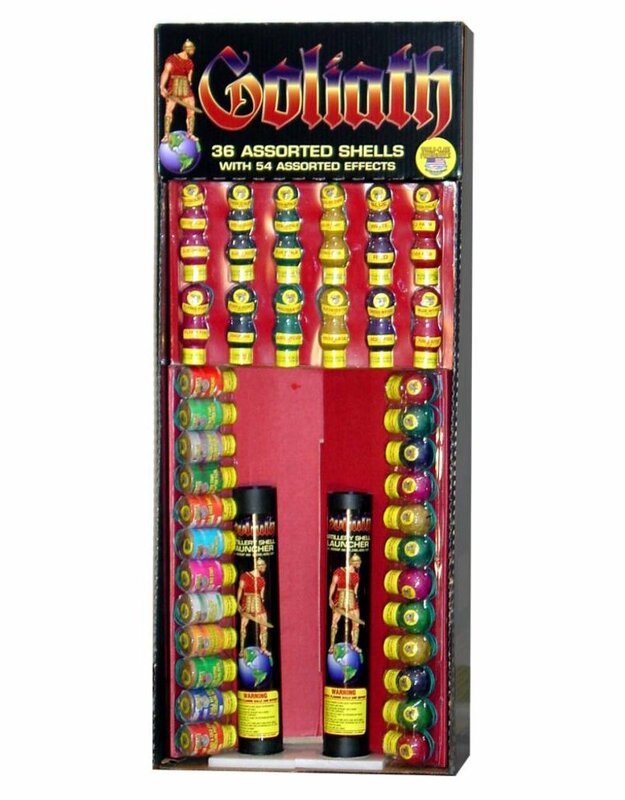 The Goliath contains 36 shells with a wide array of effects: silver & green glitter purple peony & crackling stars green & crackling stars to silver & purple stars blue & silver glitter to purple & crackling stars green peony to red peony blue peony to purple peony red & crackling to green & crackling to blue & crackling green to silver to red & silver to blue to silver green w/ red palm to red w/ green palm to blue w/red palm crackling to color chrysanthemum to silver glitter blue stars to white stars to red stars green glitter to golden glitter to silver glitter multi -colored stars green peony yellow peony w/ green stars golden glitter color chrysanthemum crackling single yellow chrysanthemum silver glitter crackling canister jumbo red stars green glitter w/ crackling pistil blue stars w/ crackling pistil.